It’s no secret that I have about 300 fandoms too many. Ever since I was three years old I’ve had my head in a book. Novels have always been a favourite form of escapism: if I don’t have a book on the go I feel completely lost. Every so often a gripping story comes along that spirals quickly into an obsession. An obsession I feel the need to talk about. Constantly. 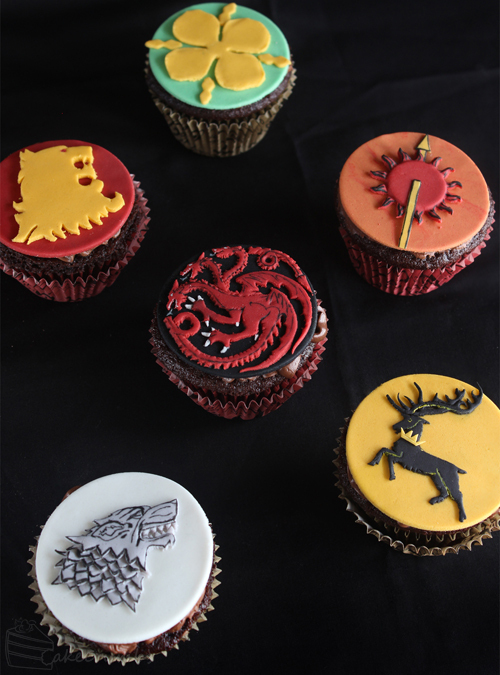 A Song of Ice and Fire, better known as Game of Thrones, is one such obsession. My other half isn’t so big on reading. Mostly he feels like he doesn’t have enough time to read and never gets around to it. I know dragging him into my favourite worlds via the written word is a lost cause, so when a great adaptation comes along there is much prodding and poking to get involved. He’s endlessly lovely about it, so he always placates me by sitting through it. Often he enjoys it, sometimes he loves it. But rarely does he match my level of obsessive addiction. Until Game of Thrones. By the time he watched it with me, all three seasons were out. His constant plot questions indicated he was getting into the show, and then randomly quoting his favourite lines. But I really knew he was hooked when he began requesting to watch the next episode until we were watching 6 in a row. And then when he wanted to watch all the seasons over again. And again. For someone who is usually a casual one-episode-a-week-is-plenty kind of fan, it was a huge deal. Now we watch it together all the time and chat about it constantly: it’s become our ‘thing’. Yesterday, the first episode of season 4 premiered. The wait had been agonising and we were endlessly excited. It also happened that the episode was airing in Australia on my birthday. The occasion called for some celebratory cupcakes. 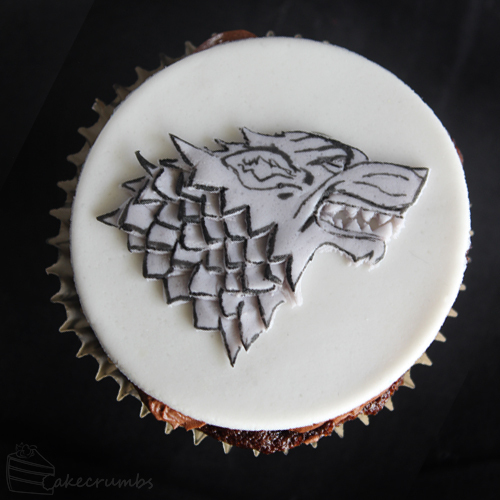 I have a number of Game of Thrones cakes on my to-do list, but there was already going to be a fair bit of cake around due to my birthday celebrations. I decided to whip up a quick half dozen cupcakes and make some simple fondant toppers. Narrowing it down to 6 houses was tough, so I decided to go for the houses that are destined to be the biggest players in the upcoming series. 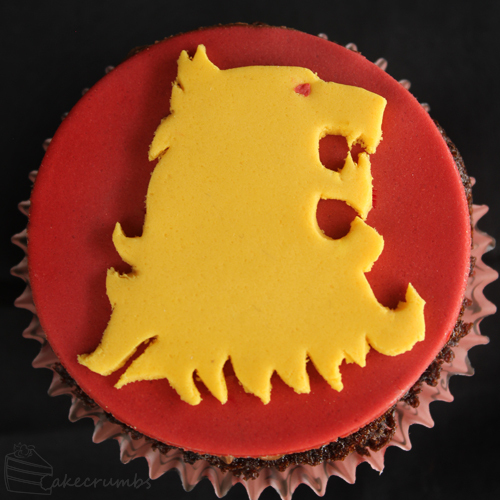 Of course there was no way I could make Game of Thrones cupcakes without making the Stark sigil. Like most, House Stark is one of my favourite houses. In part because of the likeability of every house member, and in part because of their direwolves that remind me so much of my husky pup Tobias. This animal graces their sigil, often accompanied by their house motto “Winter is coming”. Theirs is one of very few house mottos that isn’t boastful, a trait reflected in the characters from the house. 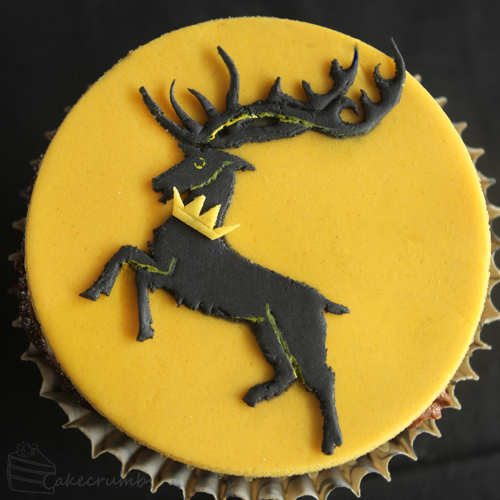 Next comes House Baratheon, whose stag wears a crown to symbolise the royal household. Their house words are “Ours is the fury”. Much as with the Starks, many of the more prominent members of the house have been decimated. But both houses still have some fairly large roles to play in upcoming events. Another house that always vies for first when I try to come up with a favourite house is House Targaryen. How can you not love the dragons, really? Their motto is “Fire and Blood”, and their sigil is a three-headed dragon on a black field. The number three is a recurring theme throughout the books in particular, but none so much as when referring to the Targaryens and the prophecy that the dragon must have three heads. While I was making the toppers the thought of favourite houses was playing a lot on my mind, so I ran a poll on deviantART to see what everyone else thought. Almost no one voted for House Martell. I can only assume more of the people hadn’t read the books yet, because boy are you guys going to learn a thing this season. In season 4 we have already been introduced to Prince Oberyn of House Martell, and what a fiery introduction it was. By the end of this season I’m sure people will be as madly in love with the Martells and those of us with ours heads in the books already are. 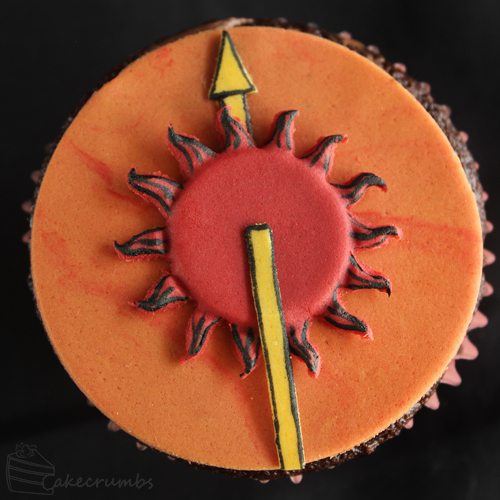 Their sigil is a sun with a spear through it, representative of the seat of their house called Sunspear. Their house motto is “Unbowed, Unbent, Unbroken”. Next up is the Tyrells, a house about to be brought into the royal fold with an impending wedding next week. 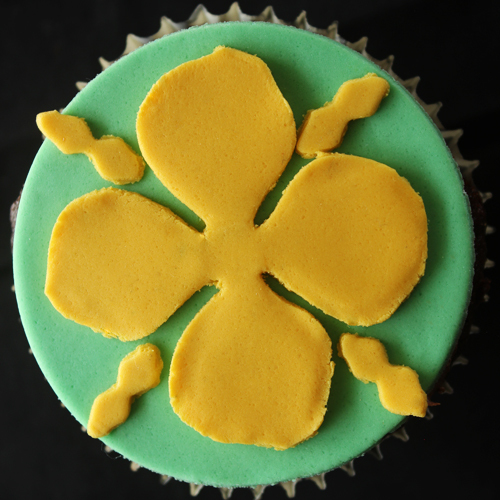 Their sigil is a golden rose on a green field. There are so many different versions of the sigil floating around, so I went for the simplest one. And last but certainly not least are the Lannisters, the house currently in power on the Iron Throne. The house you love to hate and hate to love, but do anyway. Their sigil is famously a golden lion on a crimson field, with the house motto of “Hear me roar”. Game of Thrones is known as a show that embraces blood and gore, especially after the Red Wedding of least season. 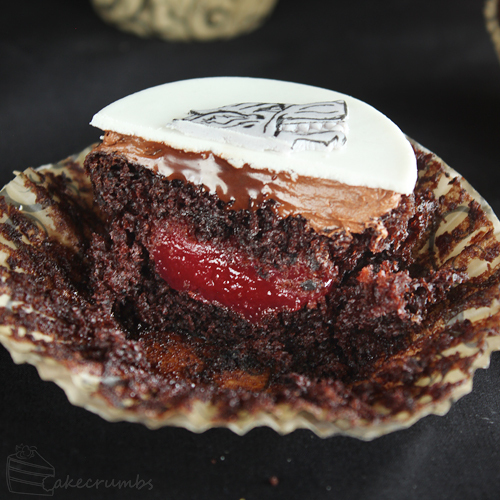 I decided to incorporate that into the cupcakes by filling them with gore. And my gore, I mean a raspberry sauce. 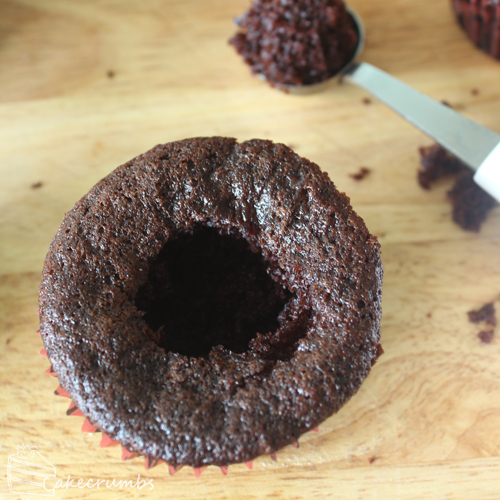 Filling the cupcakes is really simple. 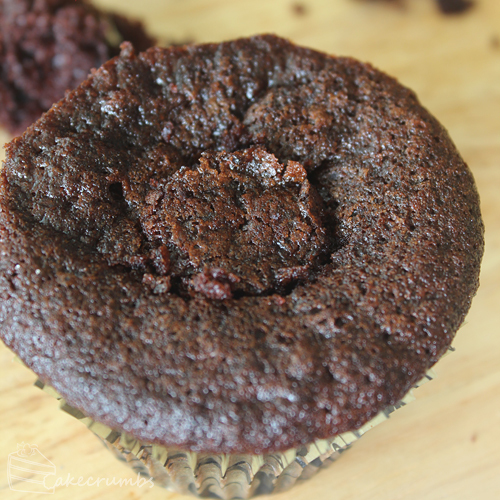 The chocolate cupcake recipe I am using is incredibly moist and light of crumb. so it takes a bit more care than firmer cupcakes. But the process is the same. You can either use a knife, spoon or a melon baller to scoop out the innars. For the sauce I took a punnet of raspberries and cooked them with some sugar and lemon juice. 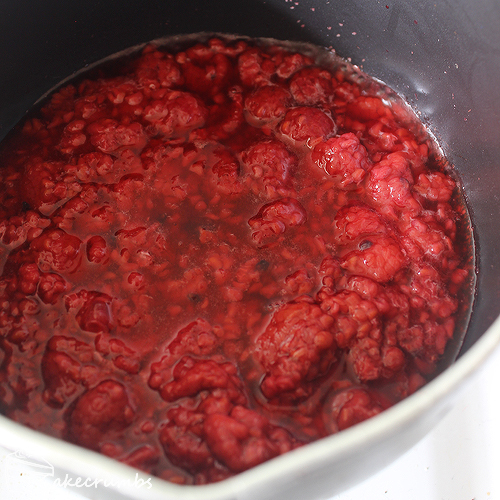 You could just heat some raspberry jam if you want to cut down on the fuss. I didn’t want any seeds in them, so I sieved them out before returning the mixture to the pan. I used some cornflour to thicken the mixture: this step is optional. because the cupcakes were so moist I wanted the filling to hold together lest is collapse. If you want a runny filling them you can skip thickening the sauce. … and plugging them back up again. While the sauce cools and sets you can set about icing and decorating the cupcakes. Preheat oven to 180°C (160°C fan-forced/350°F). Line a cupcake tray with patty pans. Sift all the dry ingredients together in a bowl. In a separate bowl or jug, mix together the wet ingredients. Make a well in the centre of the dry ingredients and pour in the wet. Whisk the flour mixture in until well combined and there are no lumps in the batter (you’ll need to work reasonably quickly as the vinegar will begin to react with the bicarb soda as soon as it meets). 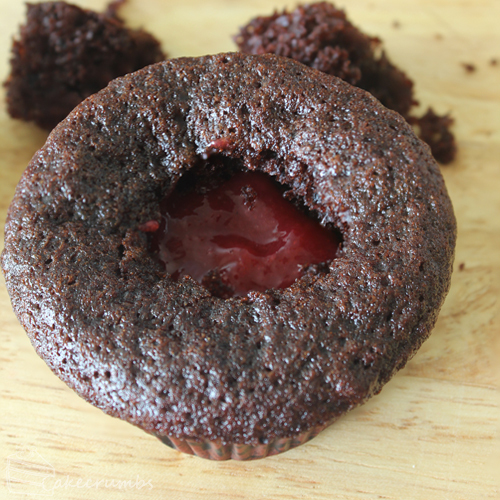 Divide the batter between the cupcake liners. Bake for 20-25 minutes, or until cake is well risen (it will bounce back when gently poked, or a skewer inserted into the middle will emerge clean). Leave them to cool inside the tray for 10 minutes, then remove to cool completely. Place the raspberries, lemon juice and sugar in a small saucepan. Cook, stirring, over medium heat until mixture becomes a syrup. If you don’t want seeds in your sauce, sieve it now, then return mixture to the pot. in a small bowl or cup, mix the cornflour with 1 tablespoon of tepid water. Pour into the raspberry mixture and stir to combine. Cook over high heat until mixture thickens and flour has been cooked out of mixture. Heat the cream in a small saucepan over medium heat until mixture boils; remove from heat and pour over chocolate. 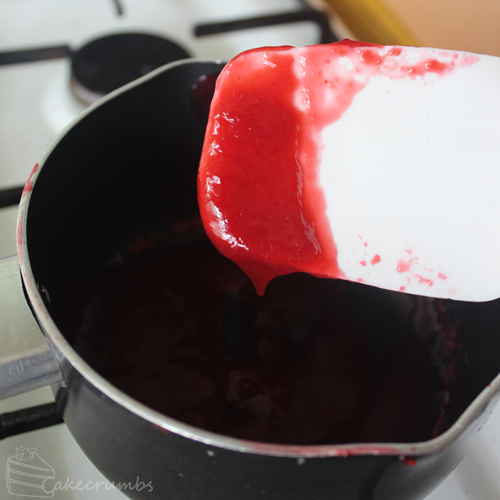 Allow to sit for 30 seconds, then stir the mixture until chocolate is melted and mixture is smooth. Allow to cool to room temperature. Beat the mixture until light and fluffy. If ganache stays pourable and won’t thicken it means it hasn’t cooled enough yet. It’s one of those things I would love to be able to make for people, but have to turn down orders due to legality issues. I certainly have got hooked on this fandom of yours. I loved the blood filling in the cupcakes. There’s no escaping once you’re in. These are excellent. 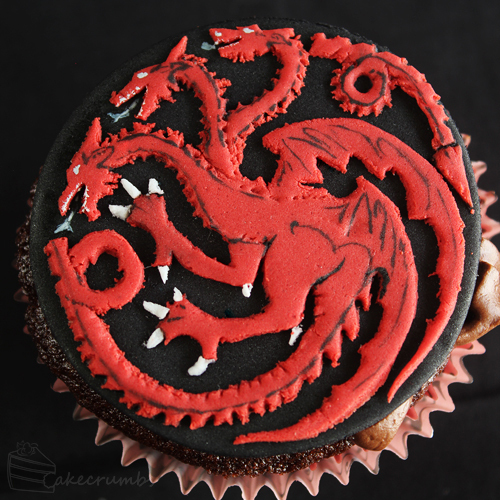 I especially love the Targaryen cupcake, such amazing detail.